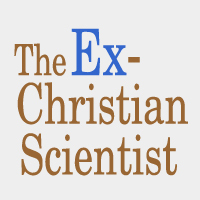 I stepped away from Christian Science, as a test. By Marie, an Ex-Christian Scientist Group Contributor. Marie is a pseudonym, to ensure anonymity. I stepped away from Christian Science, as a test. I spent a week not worrying about animal magnetism, or daily prayers, or anything like that. I just thought whatever I wanted to think. I then left CS quite suddenly and found that to be extremely difficult. I still do sometimes, especially when things are tough and I don’t know what to turn to. Some people I know who left CS after always doubting didn’t feel like it was such a big deal. We all handle it in different ways. Outsiders simplify the issues surrounding Christian Science, and that can feel dismissive. Like, ‘Hah! What a bunch of crazy, stupid kooks.’ I was one of those kooks, as are many intelligent people I love. Not to mention, in a way, it trivializes what I’ve gone through. The other day a friend asked why my roommate and I talked about our past so much. 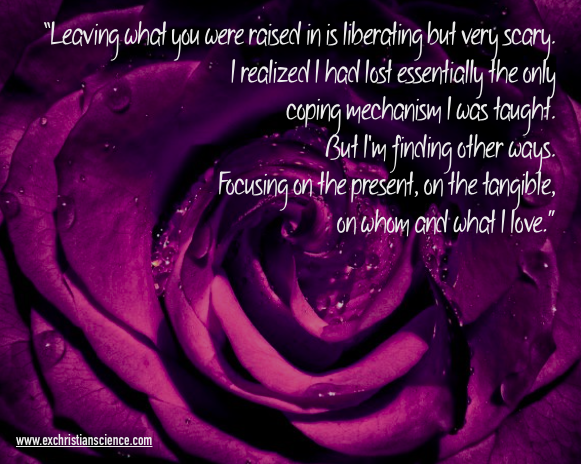 It was because it was important to us and shaped who we are. To him, it seemed something to remember and value or grieve but not to dwell on so much. I still don’t feel ready to read God’s Perfect Child. I found it in a used book store and started reading it. I had to sit there for a few moments because I felt very overwhelmed. I couldn’t bring myself to buy it. My parents often talked about the book, shaking their heads, especially since my dad taught the author in Sunday School. So of course he blamed himself. 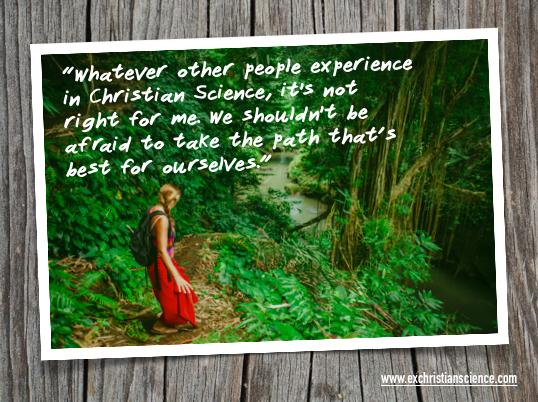 I left because I realized that Christian Science and numerous other attitudes I held were killing me. In my case at the time, more mentally than physically. It just wasn’t worth it. I was more important, living life was more important. As for whether Christian Science is correct, I decided that the more important question was whether Christian Science was correct for me. I would describe myself as an atheist now, but I also realize that literally no one knows for sure how the world works and what’s out there. It’s been a long and very difficult journey. I keep discovering new ways in which I’ve imbibed Christian Science ideology, occasionally for the better, usually for worse. I feel as though I have to construct a whole new identity and learn how to trust myself. Not practitioners, not God. Me.